Very nice, we feel it. I like the curve of the sea wall that leads my eye into the breaking wave. Thanks you very much Bill, pretty stormy day on the coast! Wow! Awesome force. Awesome shot! Thanks John, yes the ocean was showing us who's in control. Yes very big waves, but there is a safe place to watch and take pictures from. It's quite popular with storm watchers. 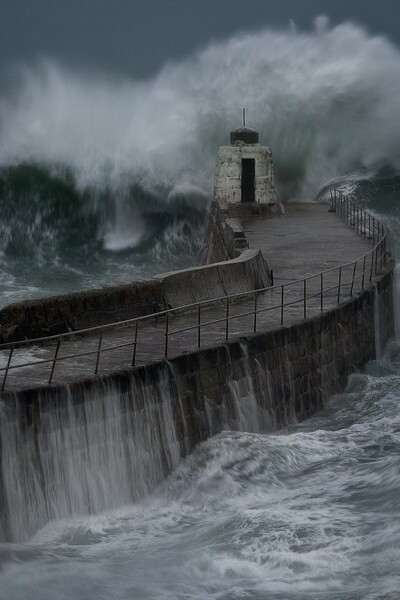 This shows the mighty power of the sea, of course it’s also a brilliant photograph. Absolutely amazing image. Really like this one!! I wouldn't worry too much Jason, this is the standard composition of the jetty - it's been photographed thousands and thousands of times! What a powerful shot! Love your style!